Three of the 5th Marine Division's regiments served in Vietnam - the 26th, 27th and 13th Marines. The 28th Marine Regiment, activated in January of 1967, served as an on-call unit in California, prepared to ship overseas at a moment's notice. The February of 1968, the 28th Marines in fact, transferred 22 officers and 600 enlisted men to the 27th Marines as the 27th prepared to ship to Vietnam. At 0600 on March 8, 1965, Rear Admiral Donald W. Wulzen, commander of the Seventh Fleet's Amphibious Task Force, issued the traditional order to "land the landing force." Soon afterward, Vancouver (LPD 2), Mount McKinley (AGC 7), Henrico (APA 45), and Union (AKA 106) began disembarking Marines for the movement ashore. When the 3d Battalion, 9th Marines crossed the beach between 0902 and 0918, it became the first battalion-size American ground combat unit deployed ashore in the extended Southeast Asian conflict. Their first mission was to protect the American Air Base at Da Nang. 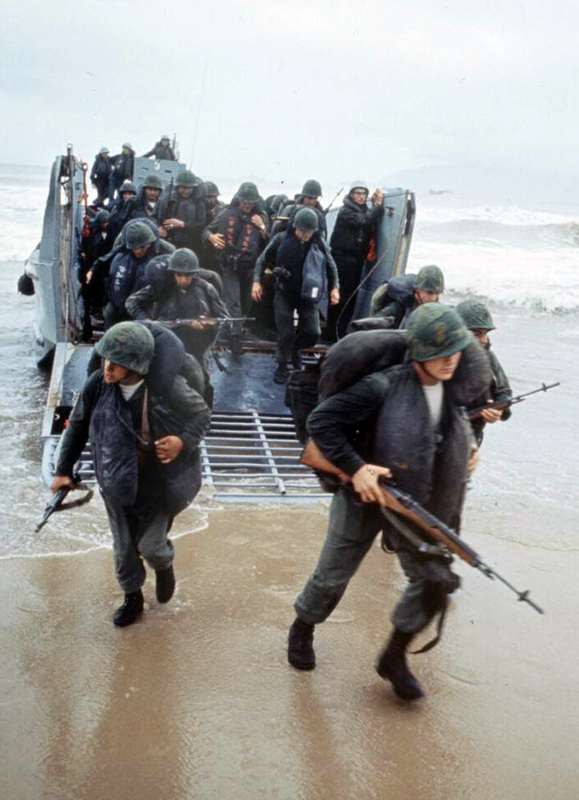 The landing of the 9th Marine Expeditionary Brigade at Da Nang marked the beginning of large-scale Marine involvement in Vietnam. Even before the full 9th Marine Expeditionary Brigade had been deployed to Da Nang, American leaders were considering the use of these Marine and following Army units in active operations against the Viet Cong. 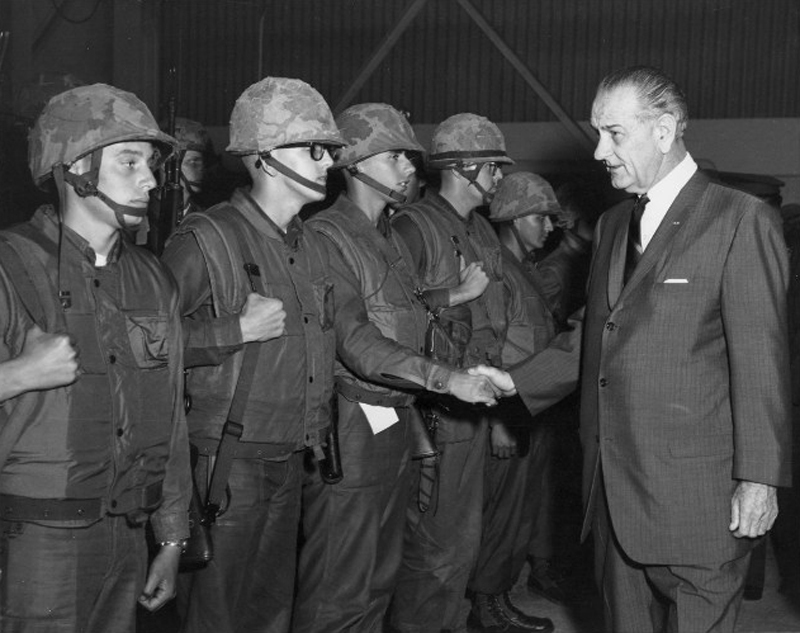 The passive defense mission was shelved on 1 April 1965 when President Johnson authorized the Marines at Da Nang to move out and engage Viet Cong and North Vietnamese forces in combat. In July, a build-up of U.S. forces in South Vietnam was ordered, and by the end of the year, 41,00 Marines were in the I Corps Zone. With the need for more manpower in South Vietnam, more Army and Marine units were called up. Secretary of Defense, Robert McNamara, approved the reactivation of the 5th Marine Division in December of 1965, but its formation was not announced until March 1, 1966. Major General Robert E. Cushman, Jr. was the 5th's Commanding General during its reactivation. The Vietnam war was a different kind of fighting for the Marines and for all ground troops. There were no front lines and no major, concrete objectives, for example, the assault on Mt. Suribachi on Iwo Jima. The Marines would establish defensive perimeters around bases, cities and airfields, and go on search and clear missions into the jungle against reported Viet Cong and North Vietnamese troop concentrations. Often contact was made with the enemy, sometimes not. In Vietnam, the 26th and 27th Marines were used as Brigades, with their Battalions constantly moving in and out of Regimental control. The Battalions were often attached and as quickly detached to and from other Marine Regiments, and move many miles by helicopter in an hour's notice. Sometimes these Battalions were at sea for many weeks, even over a month at a time, without seeing any action ashore. They were occasionally rotated to Okinawa or Subic Bay in the Philippines for rehabilitation, refitting, and training. When ashore the Battalions always fought together with other Marine units and often with U.S. Army and ARVN units. After an operation ashore they may stay in action for an extended period, or go back to sea, reverting to thier Battalion Landing Team status. Unit assignments in Vietnam were a game of checkers. The 1st Battalion of the 26th Marines and the 13th Artillery Regiment were reactivated in April 1966. The 1st Battalion, 26th Marines arrived in Okinawa on July 28, 1966 and became Battalion Landing Team (BLT) 1/26 on August 4. From August 4 to 29, BLT 1/26 entered Operation Deckhouse III, a search and clear sweep in the delta 60 miles from Saigon in the southern end of Vietnam in III Corps. Few contacts with the VC were made and the results were disappointing. From September 15 to 24, BLT 1/26 was ashore in the coastal end of the DMZ in Operation Deckhouse IV in another search and destroy mission. The first day a patrol ran into NVA company and in a vicious two hour fight killed 40 of the enemy with artillery and helicopter support. One Marine was killed. For the next three days, 1/26 fought off mortar and infantry counterattacks, killing about 200 of the enemy in the four day engagement, losing 36 Marines KIA. The enemy was in force in the area around Con Thien and Gio Linh just a couple of miles from the DMZ. 1/26 reverted to BLT 1/26 on September 25 and left the area. The 26th Headquarters and the 2nd Battalion, 26th Marines also arrived in Okinawa in August, and the Battalion was landed at Da Nang on August 27, relieving the 3rd Battalion, 3rd Marines. On October 11, 2/26 was shifted from Da Nang to Phu Bai, south of Hue. Action was light. On October 29, 2/26 entered Operation Pawnee III south of Phu Bai. Their objective was to keep Route 1 open to Da Nang, the only North-South highway along the coast. Again, action was light. The 3rd Battaion, 26th Marines joined its sister battalions when it landed at Dong Ha on December 11. All three of the 26th Battalions were now in Vietnam with units of the 13th Marine Artillery Regiment. Battalion strength was now up to about 1,200 men per battalion. November saw only light action for the 26th's Battalions but it was to pick up the following month. Both the 2nd and 3rd Battalions were just north of Hue at Phong Dien on December 23 when the VC launched a classic mortar and infantry attack. This marked the beginning of Operation Chinook. There was little action for the rest of the year as the enemy built up its forces. But Operation Chinook would continue into the new year. 3/26 had replaced BLT 1/26 as the landing Battalion after Deckhouse IV and was itself replaced in December. All of the 26th Marines' Battalions were ashore at the close of 1966. By the end of the year, nearly 68,000 Marines were in I Corps. Operation Chinook continued through January 1967 with only sporadic engagements. The operation ended at midnight on February 16 with 261 confirmed kills and 498 probable KIA. Four Marines died during Operation Chinook. Operation Chinook II started on February 17 running through April 4 with 339 confirmed enemy KIA and 666 probables. Khe Sahn was a forward base manned by the U.S. Army Special Forces. It was about 10 miles east of the Laos border, 13 miles south of the DMZ, near the East-West Route 9. A Marine rifle company of the 9th Marines had been sent to Khe Sahn in September of 1966. NVA troops were constantly probing the defenses of the base at Khe Sahn and its air strip. On April 24, two Marine platoons ran across a strong enemy force about 5 miles from the base and the fight began. 13 Marines were KIA. Two battalions of the 3rd Marines were sent in the last week in May to flush out the enemy. Sharp fighting continued for the next two weeks. It appeared the Marines had interrupted the enemy's preparations for a concerted attack on Khe Sahn. The fighting was close and bloody when the NVA pulled back on May 12, leaving 940 bodies and graves behind. The Marines lost 155 KIA. On May 13, the 2nd and 3rd Battalions of the 3rd Marines were redeployed and relieved by HQ, 27th Marines and its 1st Battalion. This ended the first battle of Khe Sahn, since it had no code name at the time. On May 18, east of Khe Sahn, 2/26 and other units were assigned to raid into the DMZ to cut enemy infiltration down to Route 9. They took off from Con Thien, barely one mile south of the DMZ and struck north. This began the 10 day Operation Hickory. In two days the attack killed 61 NVA soldiers. By May 28, all Allied units in the operation including ARVN infantry and Navy shelling had accounted for over 800 enemy dead. By June, the operation around Khe Sahn had earned a code name: Crockett. June saw attacks by VC and NVA in the hills north of the base. On June 6, an 18 man Marine radio team killed at least 10 enemy, losing 6 Marines. On June 7, Company B, 1/26 surprised two enemy companies north of the base. In a heated two hour fight, the enemy left 63 dead behind when it made an escape. 3/26 was the ordered into Khe Sahn. On June 27, the enemy attacked hill positions of the Marines with mortars, rockets and artillery, killing 5 Marines. The next day, a platoon of Marines flushed out several enemy companies on Hill 689, called up the 3rd Battalion, and when the enemy broke off after two hours, 28 enemy dead were found. Enemy action around Khe Sahn then diminished and Crockett was ended on July 16, and renamed Operation Ardmore. Contacts were light around Khe Sahn for the 1st and 3rd Battalions for the next three months, and Ardmore was ended on October 31. In September, the action began to heat up around Con Thien, just below the DMZ. Since this was in an area known as "Kingfisher" it was called Operation Kingfisher. On September 7, Company I, 3/26 from Khe Sahn ran into a large force of NVA south of Con Thien. Company K was called in with tanks and five hours later, 51 enemy were counted. Three days later in the same area, 3/26 contacted an NVA regiment and in four hours the enemy broke off suffering an estimated 450 dead. On September 25, the enemy shelled the area with 1,200 rounds of mortar, rocket and artillery fire, then withdrew. Action subsided and Kingfisher was terminated on October 31. November 1 began minor contacts at Khe Sahn that would continue well into 1968. It was designated Operation Scotland. At Khe Sahn during this time was the 1st Battalion, 26th Marines and the HQ, 26th Regiment. On December 13, the 3rd Battalion was recalled to Khe Sahn, along with a 155mm artillery platoon. There were no significant actions around Khe Sahn for the rest of the year. By January 1968, there were 21 Marine Battalions in Vietnam (out of a total of 36), over 81,200 Marines, and one third of the entire Marine air arm. Operation Scotland was still in effect at Khe Sahn and with four NVA regiments within 12 miles of the base, on January 16 the 2nd Battalion, 26th Marines was ordered up to Khe Sahn and the Regiment now had all three of its Battalions under its command. On January 20, a company of 3/26 contacted an NVA battalion north of Khe Sahn, called up the Battalion, and killed over 100 of the enemy. The next day the NVA overran the little village of Khe Sahn, and blew up and ammunition dump. Scotland was heating up. Before January was ended, an ARVN Ranger battalion was added, and the the 1st Battalion, 9th Marines arrived. There were five Battalions at Khe Sahn now, with impressive supporting artillery. The Marines were deployed around the perimeter and in the hills surrounding the base. It was a scene primed for a fight. On January 29 the enemy launched its 1968 Tet (New Year) offensive, hitting numerous cities, towns and military installations with rockets, mortars and infantry throughout I Corps. The offensive lasted through the end of February and was extraordinarily violent. In the end, the enemy had accomplished almost nothing. At Khe Sahn it began on February 5. Companies of 3/26 were on Hill 881, Companies of 2/26 on Hill 861A and Hill558, and a platoon of 1/26 on Hill 950. Other units were around the perimeter of the air strip. Sensors indicated that the enemy was forming up to assault Hill 881. Air strikes and artillery decimated the enemy formations. An NVA battalion attempted an assault on Hill 861A; Company E, 2/26 attacked and left over 100 enemy dead in the jungle. On February 6 the NVA, using flame throwers and tanks, attacked the Special Forces Camp at Lang Vei, six miles from the air strip, and shelled Khe Sahn. Air and artillery destroyed three of the NVA's nine tanks. 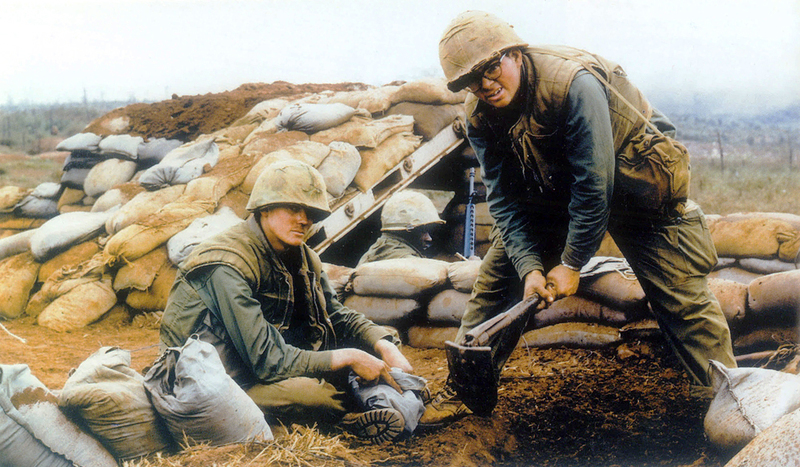 The next day an NVA battalion penetrated the perimeter defenses but was thrown back by 1/9 Marines. The enemy continued to throw mortar and artillery shells at the Marine base. Only sporadic contact was made with the NVA through the end of February and on into early March. Enemy ground fire shot down a C-123 supply plane on its approach to the air strip on March 7. 48 Americans died in the crash, most of them Marines. On March 18 the NVA breached the perimeter defenses but the ARVN Rangers threw them back. On March 30, Company B of 1/26 assaulted and routed an NVA battalion south of the base. On that day, Operation Scotland was terminated. 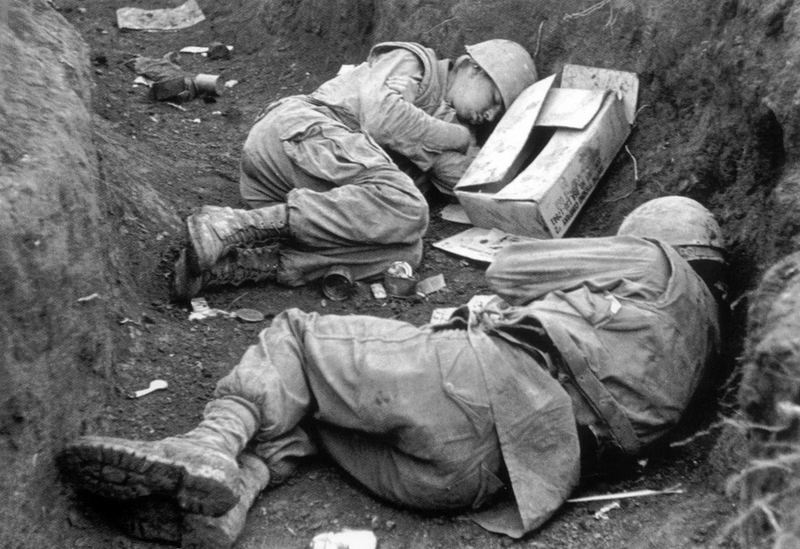 SInce mid-January, 200 Marines had been killed at Khe Sahn and 830 wounded. At least 1,600 of the enemy were killed. Between February 17 and 28, three Battalions of RLT 27 of the 5th Division came into Vietnam together with the 2nd Battalion of the 13th Artillery. They were sent to the troublesome coastal area between Marble Mountain and Hoi An, south of Da Nang. Relief of the men at Khe Sahn was ordered and on April 1, Operation Pegasus began for this purpose. The relief units were the 3rd Brigade, 1st Air Cavalry, the 1st Marines, and four ARVN battalions. On April 4, units of the 26th attacked south from Khe Sahn and in two days linked up with units of the 1st Air Cav. By April 12, the east-west Route 9 was open for traffic. 1/27 meanwhile, was sent to the city of Hue early in April, to help mop up after a massive enemy attack on the city had failed. On April 14, 3/26 took Hill 881 and Pegasus was terminated. Khe Sahn had been under siege for 77 days. The Battalions of the 26th were now withdrawn from the embattled camp and given a brief rest. Late in April the enemy had moved into the "Go Noi Island" area (a delta of river meandering 10 to 15 miles southeast of Da Nang and between Hoi An and An Hoa) with the equivalent of a full division of troops. Da Nang was their eventual objective. To keep this force out of reach of Da Nang, Operation Allen Brook was initiated on May 4. Several hot fire fights were stirred up by the 7th Marines and on May 17, the 5th Division's 3/27 ran into a large NVA force. The 27th Marines were now controlling the Operation. In the next 10 days the 1st and 3rd Battalions, 27th Marines, the 1st Battalion, 26th Marines and several other units of Marines and ARVN troops decimated two NVA regiments. 1/26, operating west of the Go Noi delta region, had short but sharp fire fights on June 5, 8 and 15 near the "Dodge City" area. The evacuation of Khe Sahn was begun at this time, and completed on July 5. Khe Sahn had outlived its usefulness as a forward base. During July and August the Marine units gradually squeezed the Allen Brook area into a smaller and smaller radius of action. By the middle of August, the NVA and VC units managed to get some troops on the southern outskirts of Da Nang. On August 22 the enemy's leading elements were intercepted by ARVN Rangers, killing 80 of the enemy. On August 23, a VC battalion had a foothold on the south end of Cam Le bridge about 1.5 miles from the Da Nang air base. Company A, 1/27 was called in and it dispersed the enemy battalion. More NVA battalions were moved up toward Da Nang and on August 25, Company F, 2/27 was called in. By August 31 when the enemy broke off the attempt, they had suffered over 1,000 dead. Allen Brook was terminated on August 24. The entire month of September was generally quiet for the 26th Marines, and even quieter for the Battalions of the 27th as they left Vietnam for rotation back to the States. The 27th had been in Vietnam since February. On October 4, BLT 2/26 was just south of the DMZ and six miles north of a place called "The Rockpile" which was on Route 9. The Battalion ran across a samll, but well-entrenched enemy force; they called in the 16-inch firepower of the battleship USS New Jersey and wiped out the enemy force. BLT 2/26 had been landed twice in August but made no contact with the enemy. Other than this contact, October was a fairly quiet month along the DMZ, so 2/26 was redeployed to the area south of Marble Mountain in Operation Eager Hunter, but they found no enemy force. 2/26 then joined the 1st Marines in Operation Garrard Bay in search and clear operations. Garrard Bay lasted until November 16 and during the Operation, Da Nang sustained far fewer rocket attacks. November 20 began Operation Meade River about 15 miles south of Da Nang, in the old Allen Brook area. BLT 2/26, BLT 2/27 and 3/26 were in on this sweep. On December 8, after over two weeks of squeezing elements of three enemy regiments into smaller and smaller pockets, 3/26 caught up with the enemy force an killed 250. The next day, Meade River was terminated. 1,210 enemy dead were counted in the 19 day action, nearly his entire force. On December 15, BLT 2/26 made its last landing of 1968 south of Hoi An in Operation Valiant Hunt. No significant contact was made through December 26 when Valiant Hunt was closed and Valiant Hunt II began. In the last five days of the year and through January 5, 1969, the Battalion killed over 240 of the enemy at a loss of three Marines. 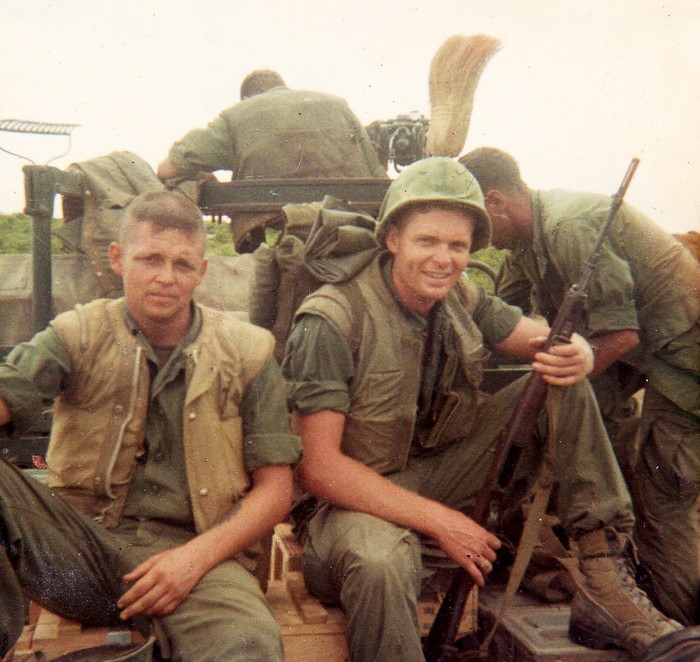 As 1968 closed, it seemed that the end of the war was no closer for the 26th Marines. On January 13 of the new year, BLT 2/26 and BLT 3/26 were landed by helicopter and landing craft on the Batangan Peninsula, about 70 miles south of Da Nang in a civilian/enemy sweep called Operation Bold Mariner. The Operation was ended by February 9 when both Battalion Landing Teams were back aboard ship. Bold Mariner netted 239 enemy killed and 256 VC screened from 12,00 civilians. From February 10 to 16, BLT 3/26 landed just south of Hoi An in Operation Defiant Measure. No contact was made with the enemy. It seemed that the VC and NVA were now reverting almost wholly to guerrilla and terrorist activities from large unit operations. On March 1, BLT 2/26 was landed northwest of Da Nang in Operation Eager Pursuit (1/26 was in this area also) and in small scale fighting found and killed nine of the enemy but at a loss of five Marines. The Operation ended on March 10. Eager Pursuit II began on March 11 and continued to March 27 and found BLT 2/26 sweeping the Go Noi Island area southwest of Da Nang. Resistance was minimal in this Operation, although many mines and booby traps were found and disarmed. 1/26 then replaced 2/26 as the Battalion Landing Team, and 1/26 went aboard ship as part of the Special Landing Force (SLF). 3/26 then became involved in Operation Oklahoma Hills (March 31 to May 29) along with the 7th Marines, about 30 miles southwest of Da Nang in the "Happy Valley" area. April found the 26th's Landing Force Battalions in more or less routine search operations west and north of Da Nang without encountering any strong enemy resistance. From May 5 to May 20, BLT 1/26 was helicopter lifted to the "Barrier Island" area south of Hoi An in Operation Daring Rebel. Although prisoners and weapons were captured, the Operation results were disappointing. On May 23, BLT 1/26 moved west in a search Operation Gallant Leader but without making contact with the enemy after two days. May 26 began the long Operation Pipestone Canyon in an attempt to clear the "Rocket Belt" around Da Nang. IT was to last until November 7. The 26th's Battalions were in this search operation to find and destroy the enemy's rocket launching positions that had been harassing Da Nang for as long as the Marines were protecting the big base. The 26th's Battalions were in and out of this Operation for the next several months. BLT 1/26 was moved to south of Hoi An in Operation Bold Pursuit on June 27. 42 of the enemy were killed at a cost of four Marines. The Operation ended on July 6. Four days later, on July 10, BLT 1/26 was heli-lifted to north of Hoi An in the 10-day Operation Mighty Play. Again contact was made resulting in 31 enemy dead with two Marines killed. On July 24 BLT 2/26 was heli-lifted to an area 15 miles south of Chu Lai in Operation Brave Armada that was to last until August 7. Again, limited action with the enemy, resulting in 11 enemy dead and one Marine killed. Finally on September 7, in the last landing of the war by the Special Landing Force, BLT 1/26 was transported by helicopter and landing craft to just south of Hoi An on the "Barrier Island". It was a combined operation with the Korean Marine Brigade and resulted in a significant fight. At its end on September 19, 293 enemy dead were counted and 11 VC captured at a cost of four U.S. Marines and one Korean Marine. The Special Landing Force Battalions were then assigned to reserve status and there were no further actions for the Battalion Landing Teams for the remainder of the war. The function of RLT 26 was over. During and immediately following January of 1970, RLT 26 was redeployed home to Camp Pendleton to be deactivated. Its units had been in Vietnam since August 1966; three years and four months. The Marines and Army had undergone gradual withdrawal from Vietnam for the past three or so years, and in May on 1971 the last Marine infantry Battalion, 2/1, stood down. By the end of June there were only 500 Marines left in Vietnam, from a peak strength of 317,400 in 1968. Because of rotation policies, some 500,000 Marines actually served in Vietnam. From January 1961 through September 1975, total U.S. casualties in Vietnam were 38,433 KIA. 5,168 died of wounds, and 2,864 died while missing, captured or interned. Of the Marines, more than 13,000, about 28% of the total, were killed in action. Marine wounded were about 90,000 and MIA less than 100. During their stay in Vietnam, all Marine units together had taken more than 4,000 prisoners and (although no reliable numbers are available) accounted for at least 87,000 enemy known killed. The valiant ARVN troops would not be able to stem the NVA and VC tide. After four more years of blood jungle fighting, Saigon fell on April 30, 1975, and all remaining Americans in Vietnam were evacuated. The longest conflict in which the United States had ever been invloved - from 1961 when the first Marine gave his life - was ended. by Philip A. St. John, Ph.D.